Every Friday when I confer with individual students regarding their independent reading, I inevitably end up sending a good number of them to the school library. Often I send them to find a book that is more appropriate for their individual reading level, or I send them because I have just thought of a title that might pique their particular interests. I even call ahead to the library staff and enlist their help in directing a student to a particular author, or a high-low book on a particular topic. This habit has become such a part of our routine, that now outside of the reading class, during CORE or homeroom, students are asking me for passes to the library to return and check out books. I must admit, then, that I was feeling pretty self-congratulatory about my efficient use of my school's resources until I read an article in the latest issue of American Teacher. 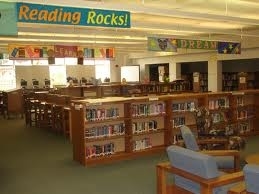 The article features ways teachers can use the school library to enhance their teaching, and I realized I am not taking full advantage of all that a school library can offer. Of course, like you, I was technically aware of the resources avaliable in the library, but let's be honest, I have tests to prepare my students for. I can't spend countless hours encouraging them to explore the library. However, according to the article, "research shows that reading scores are higher when students have access to a well-resourced library staffed by a certified librarian who works with teachers on instruction and provides staff development on information technologies." So now the new question I am asking myself is, "Do I have the time to not expose students to all the library has to offer?"